Jump on your board and go fast. Then put your back hand in the water and you will start to spin. 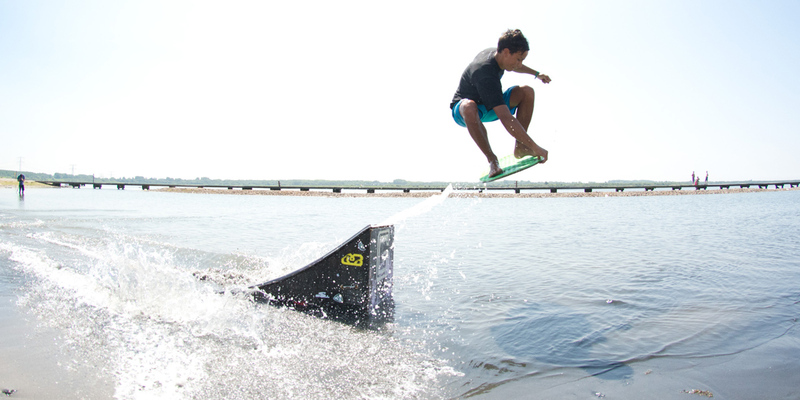 As you get more comfortable on your board try this without putting your hand down. Too lazy to pick up the board and throw it again then this is your trick. Get riding do your trick and just before you lose all speed that your back foot off the board and flick the board forward with your front foot. Then run after and jump on again. You can do this for as long as you can run or until the pool runs out. This can be done with either your front foot or your back foot but basically you ride while balancing on one foot. A good way to build up to this is to try balancing on your front foot first because for most people that is the leg they favor. You can also do a skateboard push by taking of your back foot and pushing forward as you balance on your front foot. Go fast and ride straight. Then place your back hand down on the board and slightly kick your back leg out in front of you and sit down. Fan favorites are to do the Buddha (cross legged) and the Coffin where you lay back on the board.